Koki Nagahama/Getty Images11% of consumers say they’d switch to a mobile carrier that would block ads. More than one in 10 people say they would switch to a mobile carrier that blocks advertising across its network, according to a study from media and technology research company Midia. Midia surveyed 3,000 people in the US, Brazil, Australia, France, Sweden, and the UK about their digital content habits as part of its “Decoding The Adblocking Consumer” report. Overall, 11% of consumers said they would switch to a mobile carrier that blocks ads across its network. That rose to 15% among people who already use some form of desktop ad blocker and to 19% amongst mobile ad blocker users. Of course, this is just a single survey and the question itself may have been the first time its participants had ever considered whether they could switch to a mobile carrier that would block ads. While there’s no indication that consumers are yet changing carrier purely based on whether they offer ad blocking, the survey suggests it is at least an option some consumers would consider. A number of mobile carriers are currently exploring whether to deploy network-level ad blocking, which would see technology installed in their data centres to prevent most ads across the mobile web and within apps being served. Caribbean-based carrier, Digicel, was the first to roll out network-level ad blocking. Three, in the UK and Italy, is steadily moving forward with its ad blocking plans. Meanwhile, UK carrier O2 told Business Insider last year that it was exploring technologies that could be used to block ads across its network. From a carrier’s point of view, ads can account for much of the data transfer of a web page — and their networks are doing the heavy lifting. 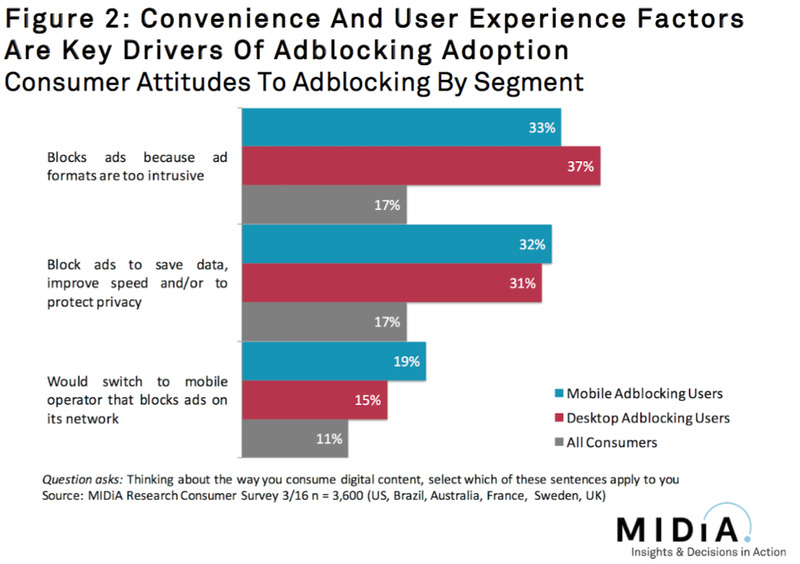 Of the consumers in Midia’s survey, 17% said they block ads because ad formats are “too intrusive” and 17% said they block ads to save on their data plans, to improve browsing speeds, and/or to protect privacy. Some online publishers — who stand to lose more and more revenue as ad blocker usage grows — have tried to thwart the effect of ad blocking by deploying their own technologies, such as denying ad blocker users access to their content unless they turn their ad blockers off. However, Midia’s survey shows around half (49% of mobile ad blocker users/50% of desktop ad blocker users) of ad blocker users will “always block ads” as long as they can. Meanwhile, about a quarter (26% for mobile ad blockers/28% of desktop ad blocker users) of ad blocker users said they would stop visiting a site if it denies access to ad blocking. As a result, Midia suggests that the best option for publishers may be the most “morally loathed” solution: Publishers should join the likes of Google, Amazon, and Criteo and pay ad blocking companies to get their ads unblocked. Company A has $100 of revenue if it serves ads to 100% of its audience. Assume 26%of users start blocking ads and the revenue falls to $74. By deploying a forceful switch-off campaign, Company A manages to convince 17% of adblocking users to switch off bringing $4.42 back to the bottom line. Company A now makes $78.42. Company B starts with equal size and revenue and faces the same problem of 26% revenue leakage. Instead of blocking users’ access however, Company B decides to cooperate with the Acceptable Ads initiative. As highlighted in ‘Decoding The Mobile Adblocking Threat’ report, 5-8% of users opt out of Acceptable Ads (counting with average 6.5%). This means that out of the $25 leakage, $1.63 is ‘lost forever’ leaving $23.37 to play for. The Acceptable Ads programme charges 30% of the incremental ad revenue. Thus out of the $23.37, Company B will pay out $7.01 in commission, keeping $16.36. Adding this to the $74 of existing revenue, Company B now makes $90.36 compared to company A’s $78.42. Furthermore, Company B managed to retain all of its readership, while Company A lost 7% thereof. (27% of the 26 adblocker users who stopped visiting due to the forceful switch off campaign). Note, that the Acceptable Ads initiative only charges publishers with more than 10 million monthly blocked ad impressions, so for many smaller publishers, the case to join is even stronger.